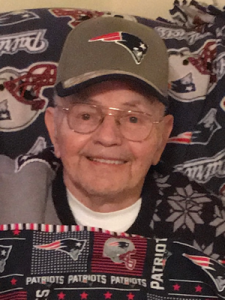 Elliot C. Thompson, 87, of Hinsdale and a former long-time resident of Winchester, died in the comfort of his home on Saturday January 19, 2019. He passed peacefully after a brief period of decline with the love of family near. Elliot was born in Winchester the son of the late Rose (Northrup) and Grover Thompson on January 25, 1931. He was the youngest of 13 children. Elliot graduated from Thayer High School in 1949. After high school he joined the United States Air Force. He was stationed in Las Vegas and then deployed to Korea for the Korean Conflict. While in Korea he proudly served his country and worked as a mechanic on combat aircraft. He was honorably discharged in 1953 at the rank of Sargent, E-5. Being a veteran was perhaps his proudest accomplishment in life. He was proud to serve and was an advocate for VA benefits for all veterans and their families. He was proud to share that he had 5 brothers in WWII who all returned home safely. They served as an inspiration to him throughout his life. He had fond memories of growing up as the baby of the family and being so loved and cared for by his siblings. He was the “Last of the Mohicans” as he so fondly and proudly referred to himself as. On March 23, 1956 he married his sweetheart, Joyce Herk from Warwick Mass. They were married at the United Church of Christ in Winchester with family and friends in attendance. Sadly, Joyce passed on December 11, 2010 after 54 years of marriage. Elliot and Joyce made their home in Winchester where they raised 4 children at their homestead on Richmond Road and lived there for over 30 years. Elliot often worked 3 jobs to support his family. Family, in his mind and heart came above all other. Being a husband, a dad, a papa and a great grandpapa, was where he found so much of his life purpose. The couple moved to Rolling Hills in Hinsdale in 2005 where they would live out the remainder of their lives. He worked at The Book Press in Brattleboro Vt. for over 40 years. He retired in 1994 and took a little time to travel. However, Elliot was not one to sit still, so he soon began his second “career” and perhaps his favorite. He became a crossing guard for the children of Hinsdale. This became more than just a job to him. He immediately fell in love with being around the children. He took this job to the next level. Not a car went by him without getting a smile and a wave, not a veteran plate passed him without a salute and not a birthday of one of the children passed without a bag of goodies being given them. For 12 years he became loved my so many passerby’s. So many students remember his warm smile and so many parents felt safer knowing Mr. Thompson was granting their children safe passage on their journey to school every day. Elliot also served as an active member of the Winchester Fire Department for over 40 years. He spent many years as their treasurer and could often be heard telling stories about the camaraderie of his fellow fire fighters and the pride he had in serving next to them. Elliot was a member of the United Church of Christ for over 50 years and served as a Deacon and volunteered for many church activities during that time. He had strong faith and his faith carried him through many life events during his 87 years. Elliot was an active member of VFW Post #3968 in Winchester. He proudly and with great intensity and integrity, gave his all for 15 plus years in making sure that the flags were placed throughout Main St. and the Evergreen Cemetery on every National Holiday that honored our country. This was one of his favorite things to do. He made sure the flags were out by sunrise and taken in by sunset on the days they were meant to be out. He was a proud man and any way that he could serve his country, made him even prouder. He marched in every Memorial Day Parade. He attended every Veterans day ceremony and most recently was able to be a Pease Greeter at Pease Airforce Base to welcome home the troops. To say he was a grateful and proud veteran would be an understatement. Although Elliot kept his days full with various activities, such as playing poker with friends, meeting work buddies for breakfast, taking his friends out to lunch, visiting people at the nursing home, watching the birds from his recliner, or taking rides on the back roads of New England, one of his favorite activities was watching Boston sports teams. He was an avid fan of the Patriots and Red Sox. He chants and cheers that he would belt out during any given game became a bit famous on social media. Watching football with Barry while eating scallops wrapped in bacon or venison stew was, undoubtedly one his favorite things to do. Elliot was a family man. He had 4 children, 6 grandchildren and 5 great grandchildren. It was family time that was most precious to him. He loved to bounce his grandchildren on his knee, do magic tricks for them, dance the “tea for two” dance with them and attend any event he could possibly make it to. Although his great grandchildren may not have known their great grandpapa for a long time, his legacy of love and honor and duty to “Help Your Fellow Man” will carry on through the generations of Thompsons to come. He was the family patriarch, their hero, their mentor and their guide during difficult times. His love is wrapped in the arms of his children and will be passed on for eternity. Elliot is survived by his daughter, Linda Ebbighausen and her husband Gary, His son, Brian Thompson. His daughter, Karen Thompson and her partner, Barry Kellom. His grandchildren; Amanda Scaff and her husband Joe, Beth D’Angelo and her husband Nick, Ashley Thompson and her partner Tyler Boucher, Jack Marsh III and his wife Nicole Vigneau, and Matthew Thompson. His great grandchildren; Mitchell and Maxwell Scaff, Patrick Vigneau, Jack Marsh IV, and Hannah Marsh. He is pre-deceased by his sons; Wayne Thompson and his infant son, James Thompson. A grandson, Trevor Thompson and his 12 siblings all passed earlier.